Quarterly financial reports - how useful are they? Quarterly financial reports: can they be the trees which obscure long term growth of the forrest? As a Board Director of a Japanese company traded on the Tokyo Stock Exchange I have to study and approve monthly, quarterly and annual financial reports, and I share responsibility for the future success of the company. It is obvious that the longterm success and growth of the company is the most important priority for all stake holders. So how useful are quarterly financial reports? Lets look at some recent developments and at an example below from our Report on Japan’s Telecommunications Industries. Britain’s leading economist, Professor John Kay, created the Review of UK Equity Markets and Long-Term Decision Making which he reported to the UK Secretary of State for Business, Innovation and Skills in July, 2012. Motivated by Professor John Kay’s report, the UK regulator removed the requirement for companies to publish quarterly financial reports. Mark Zinkula, CEO of Legal & General Investment Management, one of UK’s largest investment management firms, around 8 June 2015 wrote a carefully worded letter to 350 UK company Chairmen, recognizing that each company has different circumstances, and encouraging them to report the most meaningful key metrics and to omit reporting quarterly financial results if these don’t contribute to longterm value creation. You can download Mark Zinkula’s letter as a pdf file here. Martin Lipton, of the NY law firm Wachtell, Lipton, Rosen & Katz, in an article published on the Harvard Law School Forum on Corporate Governance and Financial Regulation blog encourages the US Securities and Exchange Commission (SEC) to keep the UK developments in mind, when reforming the reporting requirements for US corporations. The European Union (EU) reduced the reporting requirements including the requirement for quarterly financial reporting. Will Japan and other important countries such as USA follow this trend as well? Essentially all well managed companies have fine grained financial management systems which document the financial position of the company at any moment in time. As an example, when Kazuo Inamori rebuilt Japan Airlines from bankruptcy, he created a reporting system which calculates the profit/loss of every single flight in real time: i.e. when a Japan Airlines flight from Tokyo arrives in San Francisco, the pilot and everyone else knows before landing in San Francisco whether this particular flight was profitable or not – while before Japan Airlines bankruptcy, profit/loss (mainly losses for the last years leading up to bankruptcy) was determined on a full company basis every 3 months in arrears. Read Kazuo Inamori’s talk here. Clearly Kazuo Inamori thinks that such fine grained profit/loss awareness is a crucial component for Japan Airlines’ revival from bankruptcy. Its obvious that for today’s IT systems the creation of quarterly financial reports from such fine-grained measurement systems such as Kazuo Inamori had installed at Japan Airlines does not cause much additional effort or costs once the coding is done. Quarterly financial reports can be complicated to understand for highly cyclical industries: lets have a look at the quarterly vs annual reports of Japan’s mobile operators from our Report on Japan’s Telecommunications industries. It is hard to draw conclusions from quarterly income curves above. Most eye-catching is that SoftBank’s quarterly income results became much more fluctuating in the last two years. 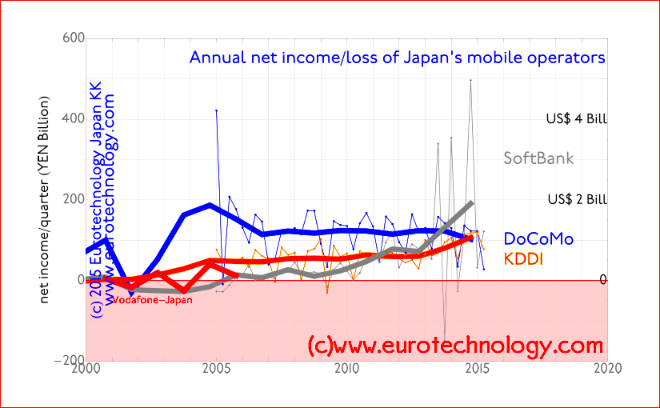 Its hard to judge the relative performance of Docomo, SoftBank and KDDI from the quarterly income curves. Annual net income curves give a much clearer picture. Annual figures clearly show that SoftBank caught up and overtook Docomo and KDDI in net profits. As Mark Zinkula points out that every company and every industry is different. In the case of Japan’s mobile operators, annual figures give a clearer picture. Will quarterly financial reports become voluntary and go away? They might partly in the UK, and maybe also in other countries. As so often in finance, the UK sets the global trends. Would focus on annual and long-term performance have prevented Toshiba’s accounting issues?